The report provides an overview of the most relevant EU policies and instruments with an impact on food waste generation and/or prevention. It explains the relevance of the different policy areas at EU level and identifies the gaps, overlaps and unintended effects of EU regulation. Finally, it identifies potential opportunities for improvement in each policy area. The report is available for download. The role of voluntary agreements and how policy makers can support their success. Policy approaches to change consumer behaviour, e.g. through on-pack information (including, but not exclusively date labelling) and information and awareness campaigns directed at consumers and businesses. The findings of this report lay the foundation for the development of policy recommendations in four areas, to be explored in following publications: use of surplus food to animal feed, building of voluntary alliances between business and policy actors, behaviour change of consumers, and unfair trading practices. For each of the policy areas a REFRESH policy brief will be published between summer 2018 and spring 2019. REFRESH is also conducting a Policy Working Group Series on these topics in 2018 and 2019. In summary, the policy review shows that there is a broad range of relevant EU policies that influence food waste generation, prevention and valorisation. In many cases, such as hygiene regulation or the EUs Common Agricultural Policy (CAP), influential differences can be found on the Member State level. Examples include the requirements for date labelling, the further use of food batches that were withdrawn due to food safety requirements, or the design of rural development measures within the CAP. The activities of the European Commission to facilitate exchange of good practices at the EU Platform on Food Losses and Food Waste (FLFW Platform) as well as the development of guidelines in various policy areas therefore provide support for improved national implementation. The broad range of different policy areas with an impact on food waste in this report shows, that there is further need for coordination and cooperation: EU legislation related to food is very complex and scattered across different policy areas, with a lack of a coherent food or food waste strategy in the EU and its Member States. This lack of a coherent strategy leads to sub-optimal trade-offs between different policy objectives (such as bioenergy promotion versus the use of surplus food for animal feed). Also it can create barriers to prevention and valorisation (e.g. with regard to some hygiene regulations, cosmetic standards of agricultural products) and missed opportunities to exploit existing policies to their full potential, especially for leveraging action at MS level. Windows of opportunities exist both to introduce new policy instruments (e.g. in the area of unfair trading practices) as well as to reform existing policies (e.g. in the area of waste regulation or with regard to the use of surplus food for animal feed). The development of an ambitious and coherent strategy for the implementation of the SDGs in Europe (that has so far not yet been developed) can therefore be an important catalyst, with synergies for food waste prevention and valorisation. Using the flexibility for countries that the SDGs provide to specify the implementation according to regional needs, the EU can lead by example by aiming for an ambitious implementation of the SDG 12.3 food waste target and include halving food losses and food waste in primary production in its scope (currently only retail and consumer level food waste are included). Furthermore, a process and/or policy to define the overall EU objectives, strategies and instruments with regard to food in general (not only food waste), e.g. through an EU Food Policy, can be a relevant step to address many of the trade-offs and improve the development of synergies. The food use hierarchy suggested in this report that emphasizes the need to keep food in the human food chain as long as possible and to use resources effectively before they are recycled, recovered or disposed can act as a guiding principle for policy design. Wunder, Stephanie, Keighley McFarland, Martin Hirschnitz-Garbers, et. al. (2018): Food waste prevention and valorisation: relevant EU policy areas. 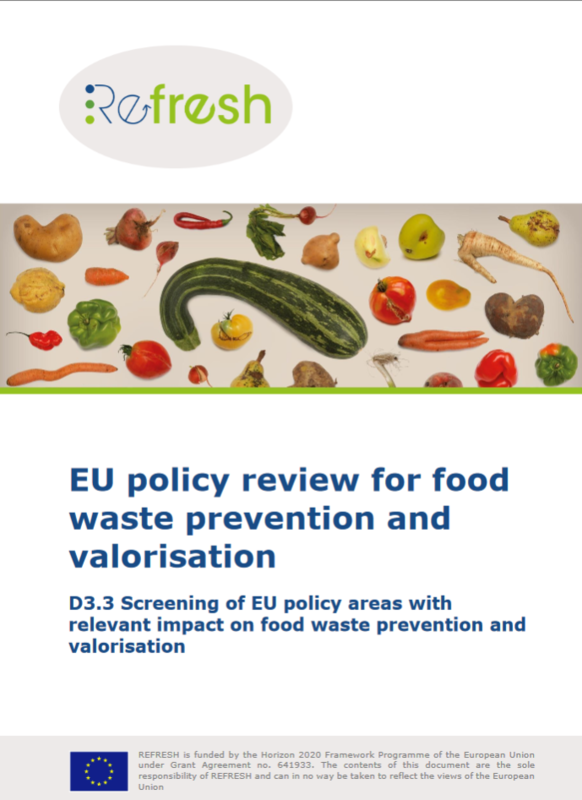 Report of the REFRESH Project, D3.3 Review of EU policy areas with relevant impact on food waste prevention and valorization. 5 Need for an EU food policy?